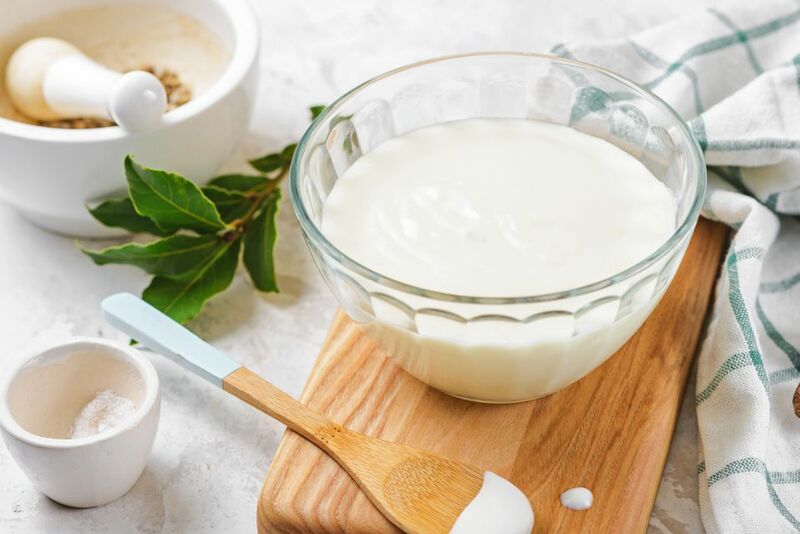 Béchamel is a basic white sauce and one of the five mother sauces of classical cuisine. That means it's the starting point for making other sauces, like the cheddar cheese sauce, the mornay sauce, and several other variations. You can also season it and serve it as-is. Or try making it with bacon or sausage fat for an amazing white gravy. The reason for using fresh bay leaf as opposed to dried is that it allows you to attach the bay leaf to the onion using the cloves like thumbtacks. A dried bay leaf will tend to crack and crumble if you try this. This is not the end of the world, since you'll be straining the sauce anyway. What's nice about thumb-tacking the cloves into the onion, though, is it makes them easier to retrieve. Again, you're straining the sauce anyway. But since a clove can crack a tooth, it's nice to confirm that the same number come out as went in. It's traditional to use white pepper to season béchamel because some chefs prefer not to see specks of black pepper in a white sauce. But if you 1) can't find white pepper and/or 2) don't mind specks of black pepper in your béchamel, you can use black. Finally, while clarified butter is ideal for making béchamel, béchamel is not nearly as fussy as hollandaise, so you can make it with ordinary unsalted butter. Just make sure you use a little bit more, because whole butter contains water, while clarified butter doesn't. In a heavy-bottomed saucepan, warm the milk over medium heat, stirring occasionally. You just want it to be warm, like around 110 F, not hot, and certainly not boiling. Meanwhile, in a separate heavy-bottomed saucepan, melt the butter over medium heat until it's liquefied. With a wooden spoon, stir the flour into the melted butter a little bit at a time, until it is fully incorporated into the butter, giving you a pale-yellow-colored paste called a roux. Heat the roux for another minute or so to cook off the taste of raw flour. As with the milk, you don't want the roux to be too hot. It should be moderately warm but not cold, either. Using a wire whisk, slowly add the warm milk to the roux, whisking vigorously to make sure it's free of lumps. Now attach the bay leaf to the onion using the cloves, and add them to the sauce. Simmer between 180 and 205 F for about 20 minutes or until the total volume has reduced by about 20 percent, stirring frequently to make sure the sauce doesn't scorch at the bottom of the pan. The resulting sauce should be smooth and velvety. If it's too thick, whisk in a bit more milk until it's just thick enough to coat the back of a spoon. Remove the sauce from the heat. You can retrieve the clove-stuck onion and discard it now. Carefully pour the sauce through a wire mesh strainer. For an extra smooth consistency, line the strainer with a piece of cheesecloth. Season the sauce very lightly with salt and white pepper. Be particularly careful with the white pepper—and the nutmeg. A little bit goes a long way! Keep the béchamel covered until you're ready to use it. Do Not Mistake Rillettes for a Pâté, Especially Not in France.